BiteSMS Beta For iPhone 5s Released, Get Downloading! 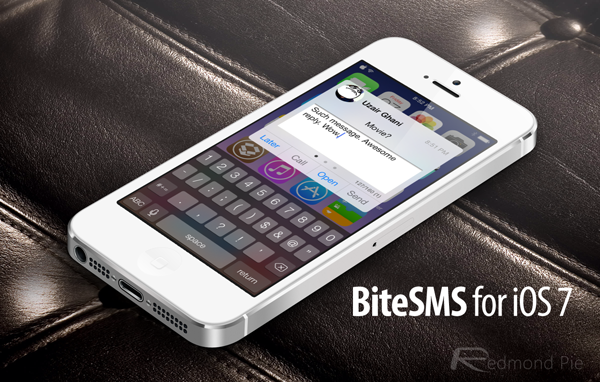 The popular BiteSMS app has just been updated with full support for iPhone 5s. The BiteSMS team have been pushing out builds thick and fast over the festive season. In the last eleven days there has been a total of six releases to the BiteSMS test repository at test-cydia.bitesms.com, with each one completing a small part of the puzzle that will ultimately involve a release of stable version of BiteSMS that supports the latest firmware as well as modern iPhones with 64-bit processors. BiteSMS is no different to any other complex package that is built for jailbroken devices in that it takes a substantial amount of work to bring it up to speed to make it compile against the ARM64 architecture. The seventh beta of BiteSMS in its current form introduces a number of important bug fixes and general stability improvements. Anyone upgrading from the last substantial beta at the beginning of January should notice a dramatic improvement in the overall usability of the product. This latest push of the powerful texting tool is also the first version that has been deemed to bring iPhone 5s support. Getting to the point where they can actually say that the iPhone 5s is now supported is a landmark accomplishment for the team, meaning that they should now be able to go through a thorough testing stage and push on from here. Compatible with iPhone 5S devices. Bug fixes and some user interface improvements. The initial beta release of BiteSMS for iOS 7 was released back on December 27th. Hopefully it wont be too long until we can welcome a stable and fully functioning version of BiteSMS back into our lives.